Mixing university and professional sport might be an unusual combination in the modern era, but not for London Irish lock Ian Nagle. The 27-year-old is currently splitting his time on the pitch and at training with time furthering his education. "It's straight back to the books tonight, I've got 2,000 words to get in for the morning," he told BBC Sport, less than an hour after playing against Exeter Chiefs on Sunday. The former Munster and Newcastle player is completing an MBA at Hughes Hall College, Cambridge University. Helping Irish's bid to avoid Premiership relegation is the other current commitment on his CV. "The amount of training I can do is somewhat limited," he added. "It's tough, but I guess I kind of enjoy it. "I prefer having something else outside of rugby. Especially when you've finished the wrong side of a result, it's nice to go home and focus on something else. "The big thing for me, because I can't spend as much time training, is to make sure everything I do while I'm away is as respectful as possible towards my team-mates. "Making sure my diet is right, I'm sleeping right and training as hard as I can to look after myself. Hopefully, I've been able to help out as best I can." 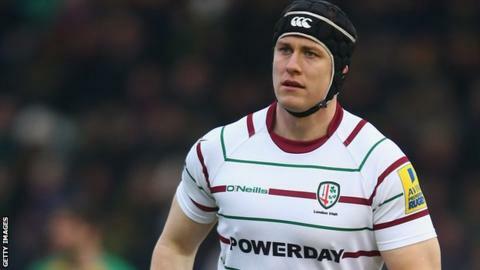 Nagle is not alone at the club in having to balance rugby with his studies, with team-mates Alex Lewington and Jimmy Stevens also busy completing geography dissertations at Royal Holloway University. Nagle represented the Light Blues of Cambridge in December's Varsity Match at Twickenham alongside Harlequins and Wales centre Jamie Roberts. Earlier this month, just as he was settling back into his coursework commitments, Glenn Delaney and London Irish came calling with the offer of a contract until the end of the season. "The opportunity came up and I was delighted to take it with both hands," added Nagle, who will move back to his native Ireland and join Leinster next season. "Thankfully, there's a couple of free days each week with the course, so I can come down and try to learn as much as I can." But will the goodwill of his tutors extend to a week Stateside when London Irish travel to New York to play Saracens next month? "I haven't even broached the subject yet," he joked. "I'll keep my head down and see if I can pull some strings."